I've previously blogged about artist Daisy de Villeneuve's work so regular readers will know that I'm a big fan of her quirky designs. If you're not familiar with her work, do check out her website http://www.daisydevilleneuve.com/. Her bold styling and artistic use of colour is perfectly suited to the beauty industry so it comes as little surprise that her latest collaboration is with Clinique in aid of the Kiss It Better campaign for Great Ormond Street Hospital Children's Charity. The Charity raises funds for research into causes and treatment of childhood cancers. 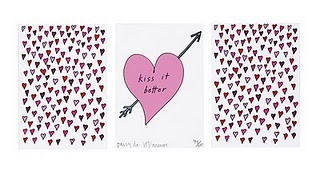 Daisy has created an exclusive, signed Limited Edition trio of illustrations which will be available throughout February for £100 at http://www.clinique.co.uk/, www.gosh.org/shop and Eleven Fine Art Gallery with all funds going to the Charity. It's a wonderful opportunity to purchase a piece of her art whilst knowing that you'll be helping such a worthy cause. I'll be wishing for this, with its adorable heart pattern, for Valentine's Day! As a very special treat, Daisy has spoken to Skin Deep about the collaboration, "I jumped at the chance to work with Clinique, a brand I've always loved! Kiss It Better particularly appealed to me because I often do workshops with children in hospital so it's a subject close to my heart. Plus, doing the limited edition print raises awareness to a much wider audience." And as it's Skin Deep, her beauty essential? "I always wear red lipstick and red nail polish"
I think I haven’t tried this product from Clinique yet.